Image of an implanted-supported denture. Too many people who have conventional dentures don’t wear them for the simple fact that they don’t stay in place. An implant-supported denture is used when a person doesn’t have any teeth in the jaw, but has enough bone in the jaw to support implants. 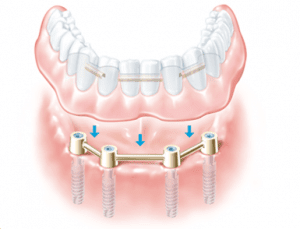 An implant-supported denture has special attachments on the denture that snap onto attachments on the implants. They are particularly helpful for the lower jaw because regular dentures tend to be less stable there and the implants help secure the denture. When a patient cannot tolerate the palate being completely covered, implants can be inserted so that the palate can be cut out of the denture. You are able to chew much better with implant-supported dentures compared to conventional dentures allowing you to go about your daily life with confidence.